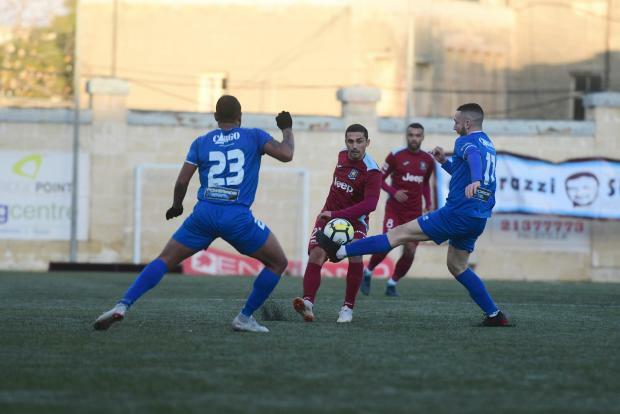 Gżira United’s hopes of claiming the BOV Premier League title suffered a minor setback after a late Darren Falzon goal condemned them to a 1-1 draw against Tarxien Rainbows, at the Tedesco Stadium. Gżira and Tarxien gave life to a pulsating start to the match as inside the first 15 minutes they both hit the crossbar while squandering other attempts. Nikolai Muscat tried his luck from outside the area but failed to put Gżira ahead. A couple of minutes later, Tarxien’s Stefan Radovanovic almost sent a cross shot inside the net only to hit the woodwork. The Maroons’ reply came through Juan Corbalan but after dancing his way inside the box, he saw his close-range effort hit the crossbar. Gżira were having to dig in to open the score and they came close on the 77th minute through Andrew Cohen whose free-kick was saved by Cassar. However, Cassar could not do nothing nine minutes from time when Corbolan whipped in a cross into the box and Cohen headed the ball home into the near post. The goal was greeted with relief from the Maroons’ clan as now they could control proceedings with a goal advantage. Five minutes from time, Garba darted into the box but from a tight angle, he could only find the side netting. Yet, there was still time for more drama as Tarxien levelled terms in stoppage time. Darren Falzon slotted the ball into the net after Gżira failed to clear danger from a corner-kick to deny the Maroons the three points. Tarxien Rainbows' goalkeeper Andrea Cassar was named BOV Player of the match.